In 1980, Keith and Judy Einstein made the brave decision to leave their home in Buffalo, New York and move to Carrollton to open a printing business. 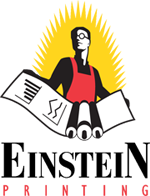 Their initial plan was to offer only quick printing services, but they quickly attracted local real estate developers who needed their blueprinting service and Einstein Printing took off! Unfortunately, however, a few years after they opened their doors they suffered from the real estate collapse of the mid-1980's. No real estate meant no developers in need of blueprinting, and that meant a sharply reduced income. It was then that the Einsteins realized that they needed to make some changes or else go out of business. "I wanted to offer a service that provided a high level of quality and knowledge but was still responsive to shorter deadlines and price points more in line with quick printers. We developed the attitude that we're going to help our clients be successful," explains Mr. Einstein. So they decided to regroup and expand into being the premier high quality commercial printing company in Farmers Branch. It was thanks to the lessons they learned during the leaner years that they found a way to provide highly responsive services while also helping their customers save money. A practice that endures to this day! 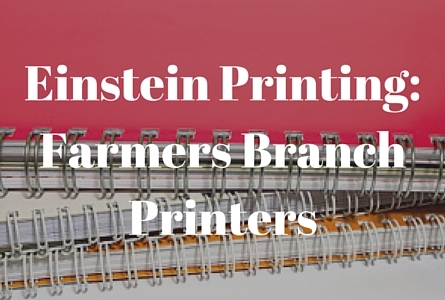 See, Einstein Printing is not just an ordinary Farmers Branch commercial printer. They cater to all projects large and small while saving their customers money and time. Their expert staff makes sure that every project is done right and on time- every time! Beyond double-sided printing or bulk printing, Einstein Printing can accommodate any project. Need a certain paper quality that's hard to find? Does it have to be a particular color or size? Einstein Printing can do it! They will even pick up your project and deliver it back to you when it's done- saving you even more time and energy. Why work with a commercial printing company in Farmers Branch? Farmers Branch Banner Printing - Need a banner or sign printed in Farmers Branch? Contact Einstein Printing! Farmers Branch Mailing Services/Direct Mail - Personalize your Direct Mailouts in Farmers Branch. We can show you how. Farmers Branch Signs and Display Printing - We'll work with you on sign and display printing. Farmers Branch Creative Services - Build a brand identity with our design specialists. Are you in need of something to give to your client so they don't forget you? Let Einstein Printing put your company logo on a pen, water bottle, coffee cup, or even a golf shirt. Don't have a company logo yet because you're just getting started? Their expert staff will work with you to create the perfect design as part of a company identity package made just for you so that your company will be easily recognizable.